The second step requires calibrating a preliminary position based on current results. That means conducting an honest evaluation with selected, trusted partners willing to share important data. The objective is to evaluate progress vis-à-vis the various steps in the model and frankly placing a marker on current position. Step three is to establish the value gap between that position and a reasonable future level. 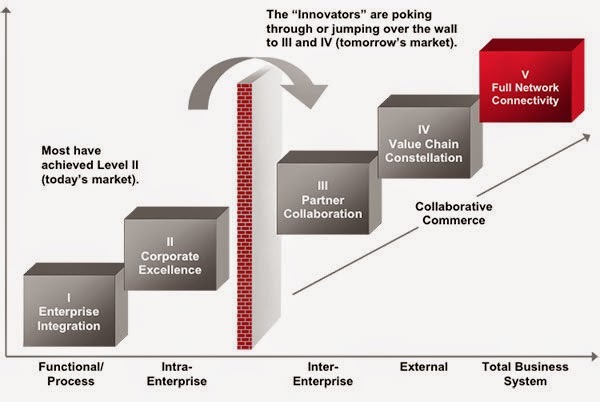 With the ranges of potential improvement provided, the evaluation should provide an order of magnitude of potential return on further effort, by following the maturity model and adopting proven best business practices. Now the logic trail branches into three segments. Start with a quick revisit of a concept you’re probably familiar with – the value disciplines of customer intimacy, operational excellence and product leadership. Determine which applies for your organization, and whether expertise in one discipline will provide a competitive advantage. Current data suggests that it might be necessary to attain excellence in all three disciplines to dominate a market. A second perspective requires determining the healthcare operational requirements, as understood by the participants, to be applied to set meaningful, stretch objectives. The third perspective includes the vital step of calibrating a second time, with key network partners, to pinpoint missing best practices. With a sense of where supply chain partners are with regard to the maturity model, a study should be made of the tools that can be applied to make further progress. These tools will be discussed in future white papers and blogs in this series. Not too surprisingly, many of the tools, including lean, quality, collaborative sourcing and transparency, will already have been applied. The purpose is to apply the right tool in the places of need for optimum benefit. The next logical step is to develop a network prescription. Just as a doctor tells a pharmacist what medicine is needed to help a patient, supply chain partners must collaborate to create tactics to reach the early initiatives identified through the diagnostics that have taken place. The key questions are: What’s needed in our process steps to improve performance? Where do we apply mutual resources? How do we measure improvement? How do we share benefits? Finally, the trail should end with a distinct plan that describes how the collaborating partners will attain total enterprise optimization. 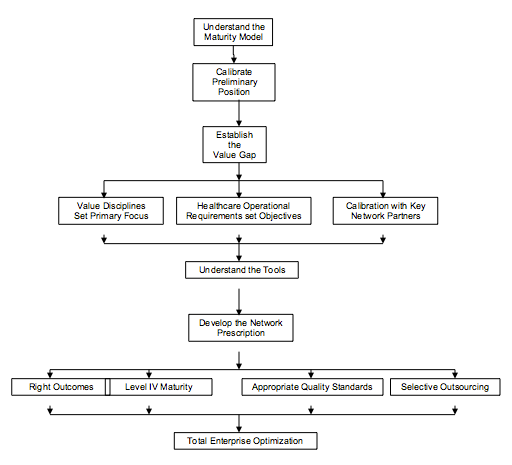 Here’s the “Five Levels of Supply Chain Management” maturity model graphic, to start your thought process around where your organization is today. My next guest blog will discuss these levels and the characteristics of each – it should be posted within a week.